For more than 1500 years men and women from all walks of life have been visiting Benedictine Monasteries and finding there a safe place of spiritual refreshment and peace. 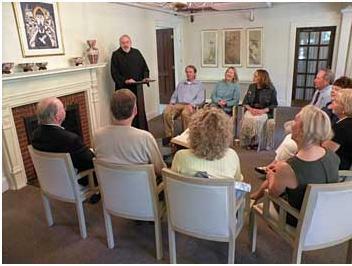 Glastonbury Abbey's RETREAT AND SPIRITUALITY CENTER is a contemporary response to this tradition and to the Rule of St. Benedict' s injunction that "all guests be received as Christ." Individuals and groups of all faith traditions are welcome to use our facilities. Guests may make one of the scheduled retreats, conduct their own program, work with the monks in developing a program, or simply come for a few days of quiet reflection. For more information please consult: Retreat Facilities and Sign Up or call 781-749-2155 ext. 300 or email retreats@glastonburyabbey.org for answers to specific questions. Please click here for a retreat schedule. Glastonbury Abbey Retreat and Spirituality Center is a member of the Association of Benedictine Retreat Centers. Contact with other Benedictine retreat centers may be made through this link.